The Usual Place (TUP) is a community café based in the centre of Dumfries. It is open weekdays from 9 am – 4 pm and sells a range of drinks, snacks, and meals. The café was established to provide high-quality, strengths-based training around catering and hospitality for young adults aged 16-26 with additional support needs, with the aim of enabling them to move on to employment. It was set up by Inspired Community Enterprise Trust (ICET), which was established by Linda Whitelaw and Heather Hall, who recognised that opportunities for young adults with additional support needs in the Dumfries and Galloway were very limited. Young people have been involved in ICET from the start, and are integral in decisions about what TUP does and how it operates. It opened in July 2015. 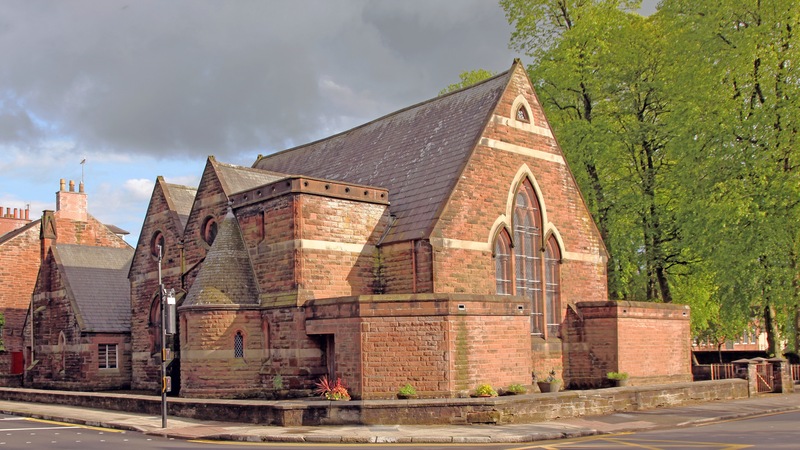 It operates from refurbished church premises (formally used as the dining hall for Dumfries Academy). The building is leased from Dumfries and Galloway Council for a peppercorn rent, and was refurbished with funding from the Big Lottery Fund. ICET had considered other premises for the café, but wanted to ensure that premises used had the space they needed and were in the ‘right’ location. The premises are fully accessible and include the only changing places toilet in Dumfries and Galloway. To achieve its aims TUP is run as a business. As well as the café, it offers outside catering, and the premises are used as a wedding and conference venue. The large café space includes a retail area selling locally-made crafts, and the building has meeting rooms for hire. The café area can also be turned into an accessible theatre. While TUP is externally funded from range of funders (to cover the high number of staff required to support the trainees), the café generated much more income than expected in its first two years. What does The Usual Place do? It provides a structured training programme that may lead to trainees being awarded an SVQ1 in hospitality, as well as other qualifications (for example, in food hygiene). Young people wanting to take part are offered an initial 6-week trial, working throughout the cafe. If they choose to stay with TUP, they can work for a further six weeks, for up to 16 hours a week (the minimum required to compete an SVQ), before deciding if they want to sign up to obtain an SVQ (which they have 2 years to complete), or if they need more time before deciding if TUP is for them. If they decide that it isn’t, TUP links in with Dumfries and Galloway Council’s Total Access Point to ensure that the young person can build on the skills they’ve developed and use these elsewhere. For TUP, obtaining a qualification is the ‘cherry on the cake’; all the trainees develop transferrable skills. It also provides work placements for school pupils, and volunteering opportunities. The young people are supported by mentors, who work with them to develop the range of practical and social skills required for working in the different areas of the café. The mentors also support them with completing their SVQ. TUP has 13 members of staff, including a chef, mentors and support staff. It is governed by a Board with seven members, including two young people. Amy, the Board’s chair, is one of the young people that have been involved with TUP from its beginning. Why does The Usual Place work? Because of the high expectations of everyone involved, both staff and trainees. The staff share the values of TUP. Trainees are expected to be reliable, good timekeepers, maintain a good appearance, and show commitment to what they are doing, to learning, and to moving on from TUP when the time is right. The young people are expected to travel independently to and from the café. No-one falls through the cracks: an exit strategy is put in place for all the trainees, no matter how long they decide to stay with TUP. TUP is not an accredited Scottish Qualifications Authority centre. The Board took the decision that working with partners to assess the skills the trainees have developed provides external validation for their work. Partnership working is key: as well as working closely with the local college, Health Board and college, it also works with local hospitality businesses to encourage them to offer trainee placements. Working with and involving families is also vital, including to demonstrate what the young people are able to achieve (eg. independent travel). And, customers are involved in assessing the trainees’ customer service skills. 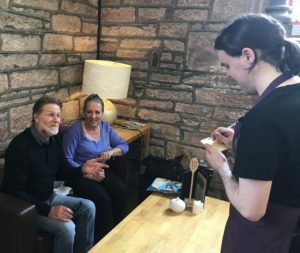 TUP has also built working links with other third sector organisations working around food with young adults with learning disabilities: the food hygiene training package it uses was developed by Windmills Café in Motherwell. And representatives from Teens+ in Edinburgh (which provides services for young adults with autism), carried out a ‘mystery shopper’ review of TUP’s café. In 2018 young people will be working with academics from Glasgow University as co-researchers, evaluating the achievements of The Usual Place and delivering a test and learn pilot in the Theatre Royal, Dumfries, transferring the delivery model to the Arts sector. In November 2017, TUP held a stakeholder event which was attended by 20 of the young people involved and over 60 other people. They were asked to comment why they valued TUP, how the community benefits from its activities, and how they felt it could develop in the future. What’s next for The Usual Place? One of the first developments planned is changing the menu, including increasing the range of food available. It is also considering extending the building’s opening hours to include evenings and weekends, but recognises this would require the menu to be adapted further. It is also looking at developing other opportunities, including setting up a kiosk in the neighbouring park (which is about to be refurbished). TUP would like to be able to support some of their trainees to set up micro-enterprises.